Loved being able to walk easily through downtown and the Belmont area. Everything was perfect. The cabin was comfortable and charming. The location was idyllic with a beautiful view of the mountains from the comfy chairs on the back porch. The bedroom was spacious and the bed was extremely comfortable. Our hosts were amazing and thought of everything. Perfect for two. Loved the walkability to the downtown mall area. Friendly prompt service when we inquired about private yoga and early check in. This was our second stay at Broadhead, and we hope to return again. The views are so beautiful, and the layout is perfect for our family. Such a warm home with interesting art. Adding on private yoga overlooking the valley was wonderful. We truly enjoyed our stay. The cabin is off a gravel road about .8 of a mile and is the only structure around which was exactly what we were looking for. There were great views from the portch. The house is large and well appointed. The grounds were the surrounding woods and a short walk up the hill takes you to the mountain top which has chairs and a beautiful area with an amazing view. Perfect setup for a couple on a weekend getaway. My only question was answered very quickly. I called twice with crazy questions and always received a quick response. Very nice staff. A pleasure to work with! I am a hotel guy. A fives star guy to be exact. I have always hesitated to rent another persons home, because I knew it would fall short of my expectations. See were traveling with my mother in law and older daughter. I knew we need two hotel rooms. With limited brand selections in Charlottesville, I decided to give it a try. Locust Grove looked too good to be true in its pictures. I decided to roll the dice and take a chance. When we arrived, I was blown away! Not only did it live up to its pictures, it exceeded them in every way. 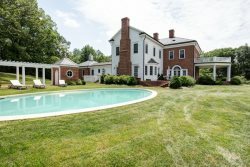 The property itself is stunning! The grounds, the house, the fixtures, I cannot say enough. It was also spotless. I mean white glove spotless. The kitchen was a gourmet's dream. I wished I had time to cook while we were there. The furnishings. Another WOW! Looks like you walked into an elegant home on the countryside in France. The beds, the linens, all top notch. I cannot say enough good things about this property. It is obvious that the owners are very caring people. You can see them in every touch.